With the name Good News, how could I resist buying one? 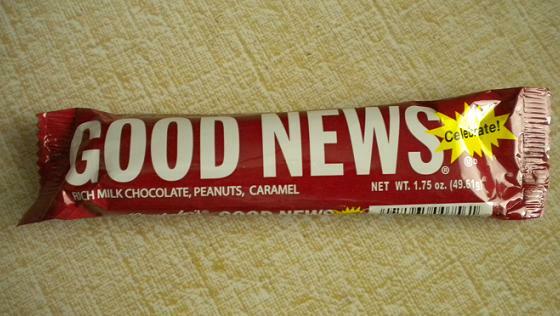 Good News wasn’t nutritious, by the way, but it was delicious. Books acquired: too many to list. 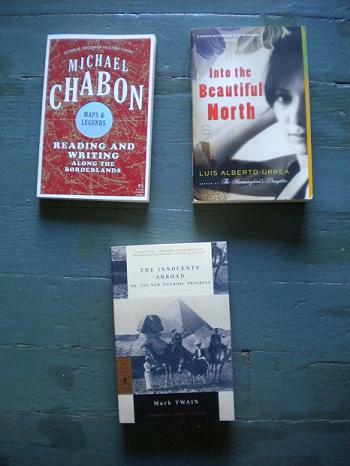 Books read: “Into the Beautiful North,” Luis Alberto Urrea; “Maps and Legends: Reading and Writing Across the Borderlands,” Michael Chabon; “The Innocents Abroad,” Mark Twain. Where did the summer go? So many activities left undone, so many books left unread (unless you’re Will Plunkett). On the other hand, my 2011 tally of books read this month encompassed numbers 48, 49 and 50, including a fat volume I’d meant to get up the nerve to read for a year or more. All had travel as part of the title, balm after a travel-less summer. Urrea’s “Into the Beautiful North”: A charming, sometimes slapstick tale of a Mexican girl inspired by “The Magnificent Seven” to bring home seven men from America to repopulate her village. Urrea gets in some jabs at American attitudes about Mexicans, terrorism and immigration and captures the wonder and strangeness of America to the visitors. Chabon’s “Maps and Legends”: Recommended for entertainment-universalists who will dote on lines like “we may have forgotten how fundamental such stories-within-stories have always been to popular art from Homer to ‘Green Acres.’ ” Essays on Sherlock Holmes, His Dark Materials, American Flagg, etc., are coupled with more personal pieces. The longest of those, about Yiddishness and golems, were the least interesting to me. 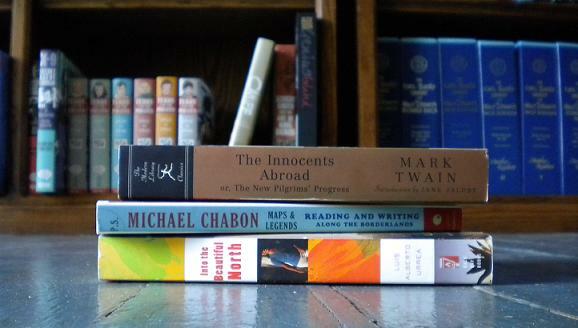 Oh, and I read most of the Twain book on my e-reader, using the paperback for its explanatory notes in the back. I downloaded a Project Gutenberg copy that had the original illustrations, a nice bonus. The fact that the edges were wearing away of my paperback (the curse of the otherwise appealing Modern Library editions) after a week of gentle reading was encouragement to set it aside. With 50 books under my belt for 2011, meeting that goal for the third straight year, my intention is to continue on the same track as in September, with fewer, longer books, many of which have been on my shelves for a lot longer than the above. How was your September, and your summer, of reading? Any reading plans for fall?